The 2.0 whey formula will be available for ordering shortly after we have prepared and released the Vegan version of our 2.0 formula. a- Ingredientswise, the only different ingredient will be the extra protein source. The Vegan version contains Soy Protein Isolate and the Whey version will contain Whey protein concentrate. These small differences will not reflect itself into the energy distribution of the macro ingredients. b- Taste and texture-wise: Because the taste and texture between the two protein-powders are different, this difference will be noticed in the shake, however we are adjusting the formula as such that the texture and consistency will be similar, while the subtle characteristic taste of each protein powder will remain. 1- Packaging: One bag will contain 12 meals of 400 kcal and will weigh 1200 gram. 2- Pricing: The price will be same for both products. Buying more will reduce the per package price. 3- Flavors: The same flavors will be available for the Whey version as for the Vegan version. 100 gram (400 kcal) contains 29 gram of proteins. Mainly coming from Superseeds Whey protein concentrate with Total BCAA’s of 23% of the total aminoacid profıle. The complex carbohydrates coming from Buckwheat, Oats, Amaranth, Quinoa make sure you have energy for at least 4 to 6 hours. No simple carbohydrates in Powder Matter. The sugar level is 0,8 gram per 100 gram. This is also the only detectable level of simple carbohydrate. Eight to 10 gram of fiber in every 100 gram you eat, is fiber. A healthy amount of balanced plant based fats with an amount of Omega 3 at a ratio of 1:1 (to Omega 6). Maltodextrin is eliminated from our recipe as a carbohydrate source. It works exactly the way sugar works and gives you exact the same troubles. No more! What % of energy from which macronutrient? 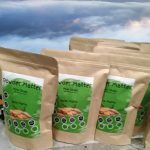 Powder Matter is a company that produces nutritionally complete, energetically balanced meal replacements for convenience at an affordable price. The first type of product are the meal-shakes which have an original and a vegan variant. What kind of supplement is it? Powder Matter is food. The purpose of it is to supply a person with a healthy and whole meal, either drinkable (as a meal-shake) or as an edible bar-meal. 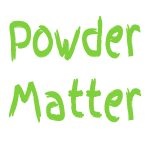 Powder Matter is not a supplement nor an additive. However this does not mean it can’t be used as a meal-replacement to diet on. But it can also be used as a mass gainer to gain weight in a healthy manner. Please see our blog post on how to. 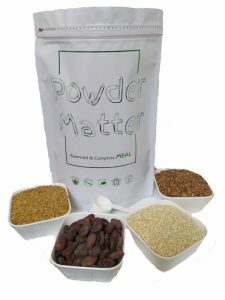 How do I prepare Powder Matter? Instructions for use: Fill a shaker with 350 ml water. Add 100 gram of Powder Matter to the shaker and shake. The amount of added water can be increased up to 400 ml when a thinner consistency is desired. Use a blender to grind down the small pieces to achieve a smoother consistency. Or try leaving the shaker in the refrigerator for a few hours before consuming. Can I live on Powder Matter meals? Even though we know and strongly believe that our meals will provide a healthy and complete meal, we would advice to build in some kind of variation in your diet to keep life exciting. See also our blog article on a personal opinion. Version 2.0 of our original formula is NOT gluten free because it contains a small amount of oatmeal. The other carbohydrate sources: Amaranth, Quinoa and Buckwheat do not contain any Gluten. The Vegan version of our original 2.0 formula has no milk products. Hence it is diary and lactose free. The Whey version of our original 2.0 formula contains Whey, which is a diary product and contains 4 gram per 100 gram lactose. 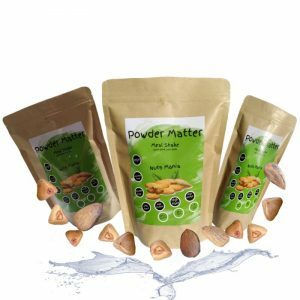 Powder Matter Original is Vegetarian because it contains whey. However our Vegan product, based on buckwheat and nuts is 100% vegan! 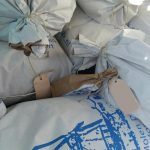 To most Western and Central European countries shipping is free from a purchase of 50 € – 100€. What is this story about the EFSA and Balances? Anything got to do with gymnastics? A certain amount of an ingredient, provides for a certain amount of energy. There are certain movements that advise on how to distribute your energy over the separate ingredients categories. Think of movements such as paleo and atkins. 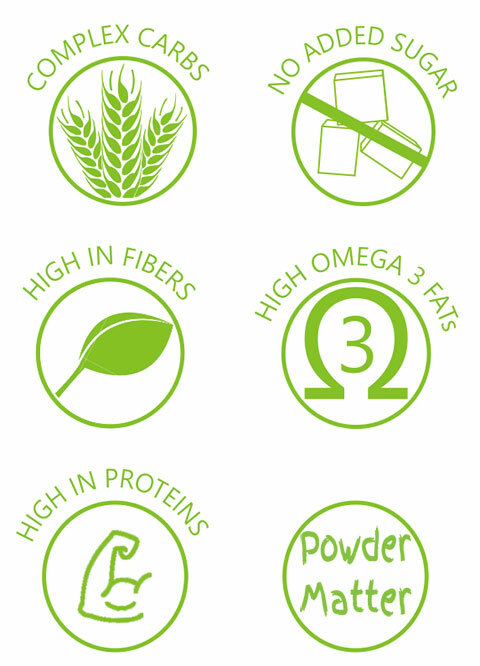 The distribution of ingredients in our meals is based on guidelines from the European Food and Safety Authority (EFSA). The EFSA publishes guidelines on food, for the general population, based on evidence based research. What does Evidence Based mean? Evidence based means that a recommendation is made based on the highest level of possible scientific research. Mostly people in the food industry, the bigger companies included, act on base of recommendations from one single dietitian or a nutritionist.